Tired. Just tired. At the August 19th Plan Commission Meeting there was more discussion and a vote on revisions to the Zoning Ordinance regarding Wind Energy Conversion Systems (WECS). Type in “WECS” in the search box to the right to see past posts on this subject including the definition per the Culver Zoning Ordinance. It was obvious that the Plan Commission members were whipped on this issue, as was I. This is one that I really wish they had employed an outside consultant on. I feel that they got bogged down on details as they focused on specific WECS’s rather than making general rules that could be applied to all systems. So be it. 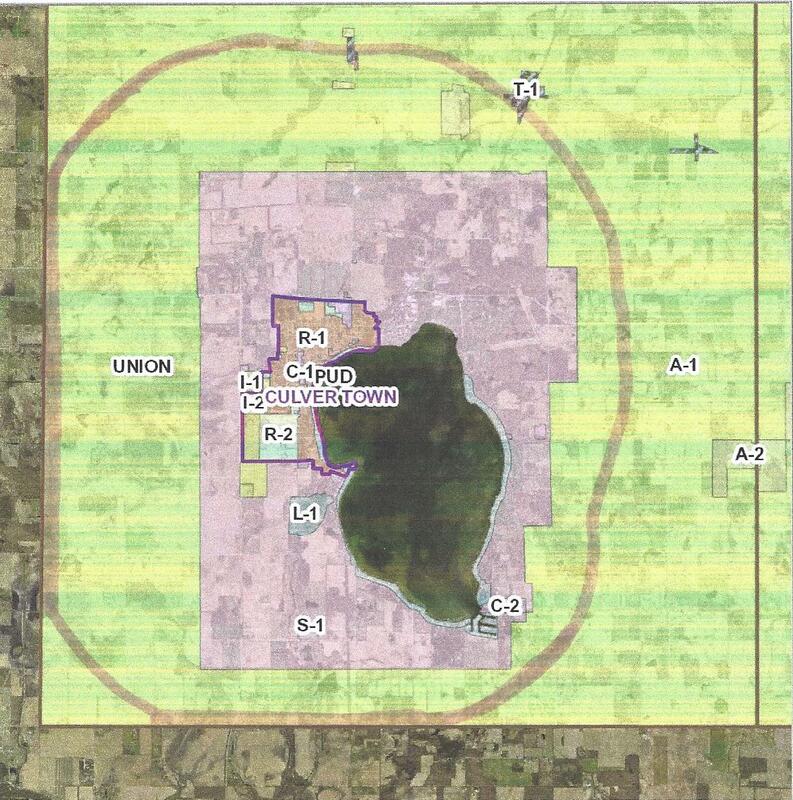 Culver’s Zoning Boundary: The pink area shows the current extended territorial authority. The loop outside that shows the approximate limits if the Two Mile area was granted. Wherever this new restriction extends past our current Extended Territorial Authority it has no effect, i.e., if our Extended Territorial Authority is only 1,500 feet from one of the “protected” zoning districts, the additional 1,000 feet has no effect because it is in land governed by the County’s Zoning Ordinance, not Culver’s. My feeling is that anything like this… things that add restrictions that currently do not affect land within the County’s jurisdiction… will make it difficult if not impossible to extend our authority to include that area. Many outside the jurisdiction will fight any attempt to extend Culver’s jurisdiction just on principle. Why give them ammunition for the battle? What many in the audience fail to understand about the above scenario is that there are other issues that will affect them. While we tried to mimic the County’s A-1 district when we created Culver’s, there are things there that are allowed by Special Use Permit. This means that they have to come before the BZA for approval. If those requests are under Culver’s Extended Territorial Authority, they come to Culver’s BZA. If they are under the County’s jurisdiction, they go to the County. The property owners within Culver’s jurisdiction may not even be notified, let alone have local representation.